Do you approve of the path trustees Jacques, Loxam and Bitten have taken the Improvement District? They have had to be dragged kicking and screaming to reality, never admitting any mistakes, and now taking credit for the work done by the very board they bashed in order to get elected. Jacques and Loxam were elected because they claimed a water treatment facility funded by the landowners was too expensive – fast forward to April 6, 2017 and guess what? According to trustee Bitten, it probably won’t cost you more than you’re paying right now. Then what was all the upheaval and misinformation caused by Jacques and Loxam meant to accomplish? Ron Wheatley and Susanna Kaljur are not tainted by any conflict of interest or perceived conflict of interest or bias. They want to represent the community and have researched – not just empty claims of research like we have heard from other candidates. What is the plan Jacques, Loxam and Bitten have now? Is it the very plan the previous board had established before these KIP supporters convinced the community the board was not acting in the best interests of the landowners? That was their claim a year ago and what has been accomplished? Aren’t we in the exact same position as when the three good trustees resigned in July 2016? Where would we be now if the previous board hadn’t worked so hard to get us in the financial situation we are in now and had a time table to meet Island Health’s mandate? These guys can’t take any credit for the very steps the previous board had already planned. Make an informed decision when you cast your ballot today. If you have watched the videos of the meetings with Jacques, Bitten and Loxam in control or should I say out of control, voting for motions they don’t understand and at the same time putting the landowners in financial jeopardy by their careless decisions. They are unable to provide answers to questions, unable to run a meeting, haven’t formed any committees, provided false answers to questions at meetings, and on and on. Jacques and Loxam were elected because they promised something that was not possible: extending an expired agreement. Who runs for election on a dead agreement without knowing if it is even legally possible to extend it and then actually gets elected? Only in Union Bay. We know now there was never any legitimate reason to extend the agreement as the developer allowed it to lapse and was never able to establish the force majuere clause he was clinging to. The landowners must insist Jacques and Loxam recuse themselves from any matters involving Kensington Island Properties aka 34083 Yukon Inc. due to their unauthorized negotiation with KIP dated June 7, 2016. 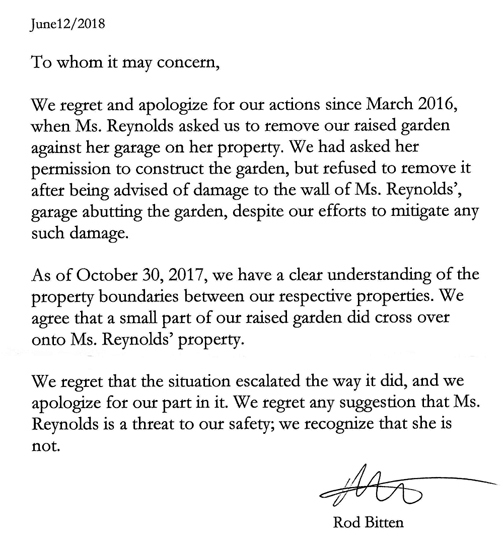 Bitten told the landowners water was not the most important issue facing our community on Oct. 17, 2016. He also said he hadn’t made up his mind about the expired agreement but claimed it was transparent and had been studied 24 hours a day, 7 days a week and then after being a trustee for less than a month, with no prior experience, ignoring the objections of two other trustees and the plea of the Administrator, he voted along with Jacques and Loxam to resurrect the agreement that expired almost 2 years previously. The landowners must insist Bitten recuse himself from any matters involving Kensington Island Properties aka 34083 Yukon Inc. due to his obvious bias if he is re-elected.